Steely Prisms to 10 inches! Copyright © 2014 Jake Harper www.earthquestminerals.com USA - This image is copyrighted. Unauthorized reproduction prohibited. On display in the newly renovated 77th Street Grand Gallery is one of the Museum's newest and most spectacular mineral specimens, a 1,000-pound Wuning mine stibnite with hundreds of sword-like metallic blue-gray crystals. The piece is nearly flawless with huge, flashing prisms to 10+ inches, some of the largest of these sporting complex, face rich terminations. 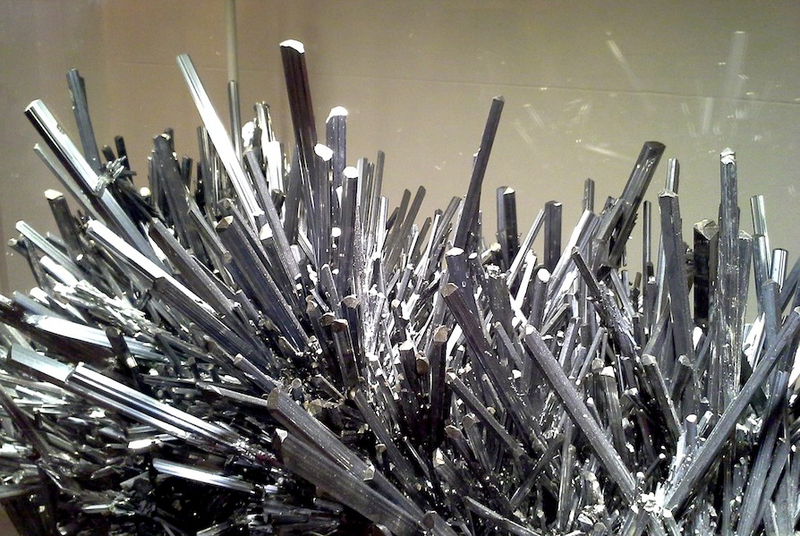 The AMNH boasts that this dramatic specimen is the largest stibnite on public display in the world. Donated by Marc Weill, founder and CEO of City Light Capital and world-renowned mineral collector. Thank you, Marc!